Clock Synchronization with the powerful KRONOsync Transmitter delivers accurate and reliable time while our Control & Protect IP-POE system offers a complete network communications platform. Our systems are easy to install, maintain and use. Innovation Wireless is an industry leading manufacturer of Synchronized Time and Communications Systems. Our product line includes the KRONOsync clock system and the IP – POE Communication System. 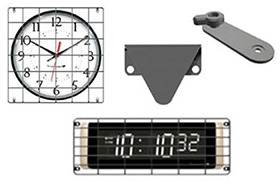 Our present day product line is built on a foundation of more than 50 years of experience in the design and manufacturing of clocks, clock parts and components. By specializing in Wireless Clocks, Bell Systems, Wireless Public Address Systems, Digital Messaging and IP POE Communication Systems we serve markets in Healthcare, Education, and Manufacturing & Government. These products in timekeeping and communications has greatly enhanced and simplified the way schools, hospitals and businesses operate and manage their organizations. Our wireless clock systems, public address systems and IP-POE systems are simple to use, easy to install and maintain. Our customers include some of the most prestigious companies in the world. Our selection of clocks both LED Digital Clocks and Analog Clocks enables our customers to improve their operational efficiency. Our user-centric IP-POE software provides customers with an intuitive platform for ease of use. A large selection of end point devices permit customers to build a communication system that advances the way organizations inform, direct and facilitate communications. Our engineering and technology expertise has positioned us as an innovator and leader in advanced clock solutions and IP-POE Communication Products. This expertise has positively impacted the way schools, colleges, hospitals and businesses connect and communicate. Organizations are required more than ever to response to emergencies and our technology increases their effectiveness in accomplishing that objective. 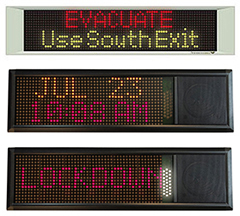 Our wireless and IP-POE message boards send notifications messages quickly and easily. They provide customers with an eye catching digital display of communication that complements their voice broadcasts. It enables administrators to take more confidence in the relevance and impact of their messages. There's never been an easier way to help keep your organization safe and informed. With this in mind our engineers built a simple but intuitive interface. It allows your personnel to execute action during an emergency with accuracy and speed. When an emergency occurs people need information. It is a natural human response in an emergency and our communication systems provides that information. Our wireless clock systems and message boards make life easier for teachers, administrative and students. Productive use of time is the keystone of great Schools, Universities, Hospitals, Manufacturing and Businesses. In K-12 schools the day revolves around the movement of students from one place of learning to another. Teachers build lesson plans in order to maximize teaching time. Accurate clocks on the wall that are synchronized with bell schedules create a highly effective learning environment and a efficient manufacturing environment. 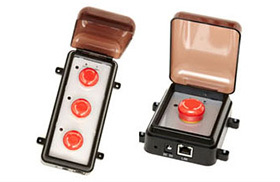 Click here to learn more about our bell and buzzer solution. Our high powered KRONOsync transmitter is transforming colleges and universities campuses throughout the United States. These institutions are under ever increasing pressure to improve their education value. Our wireless clock system provides the means for students and professors to stay on time. Visual and accurate display of time commissions the educational process to work at a high level. Our advanced technology provides complete coverage of a college campus. 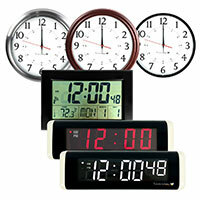 The selections of both analog and digital clocks permit our customer to match the look and feel of their institutions. Our sync clocks systems for hospitals increase the accuracy involved in the administrative task of charting time. The pressure on hospitals to control costs and minimize mistakes has never been more important. The legal, insurance and medical requirement for hospitals to accurately chart the time is safeguarded with our wireless synchronized timing solutions. Patients arriving in the emergency room are charted the moment they arrive. In operating rooms our countdown timers are used extensively to execute numerous timed medical procedures. Our advanced IP-POE software provides an organization a complete "control and protect" communication platform, thereby, providing organizations with the ability to communication in critical and non-critical times. In every market we serve our engineering moves forward not only to improve existing products but also to develop products that will save our customers time and money. We offer two wireless solutions for schools and commercial facilities. Our Wi-Fi System will operate on your existing Wi-Fi. Our Wi-Fi speaker system only requires a strong Wi-Fi signal to operate. The second system we offer is our UHF frequency based wireless PA system. This system has many advantageous for those organizations that do not have a reliable Wi-Fi network, however, have the need for a public address system. Innovation Wireless has its root in the clock industry and continues to bring innovative products. Our solar clocks are built for outdoor environments. 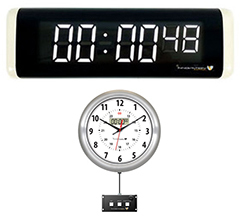 These clocks are excellent for organizations that need a large outdoor clock.